Johannesburg, South Africa's largest city with ca. 4.5 million inhabitants was established in 1886 following the discovery of gold. Spend three informative days in this city including an in-depth visit to Soweto, the township associated with the struggle against Apartheid and the 1976 uprising. 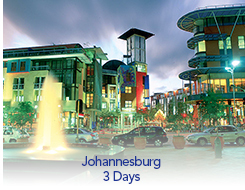 Arrive Johannesburg, where you are met and transferred to your hotel. Rest of the day is at leisure.